from the mists emerges… a Dracomancer! In 2009 the Genius Guide to the Dragonrider was released, the first in the very long and popular line of Pathfinder-compatible pdfs. The book offered rules for dragon steeds that included all the chromatic and metallic dragons and it was suggested that another class, the spellcasting Dracomancer, would soon follow. The Genius Guide to the Dracomancer is now FINALLY available and DriveThruRPG! 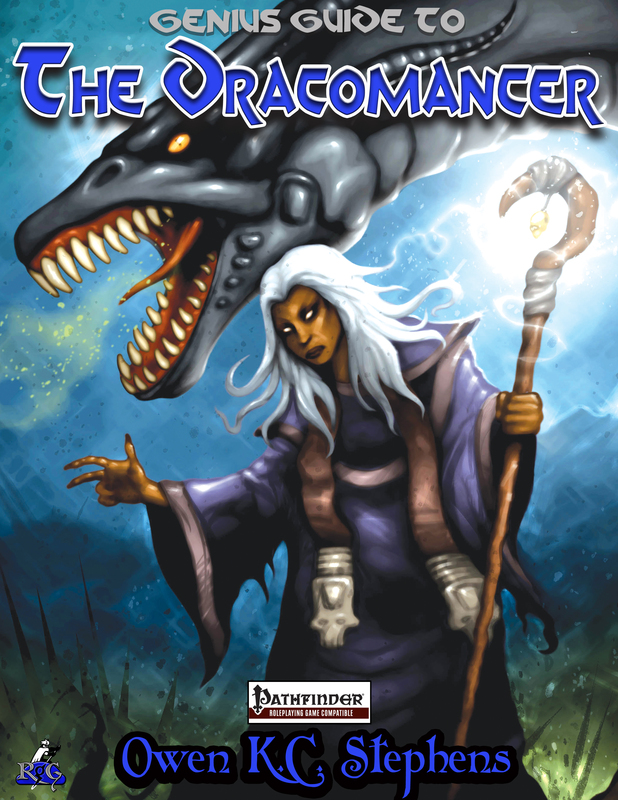 The Dracomancer is a new base class, designed for use with the Pathfinder Roleplaying Game. It is a spontaneous arcane spellcasting class that draws upon the themes and abilities of dragons, and has a draconic companion that acts as guard, ally, and advisor. Dracomancers are similar to sorcerers in that they have a deep connection to a source of magic power, but in the case of the dracomancer the power source is the mystic energy all dragons draw upon rather than the mystic inheritance of an inhuman bloodline. Additionally since the stats for draconic companions and dragon steeds (from the Genius Guide to the Dragonrider) are interchangeable , the nearly 30 draconic companions presented in The Genius Guide to the Dracomancer can be used as new steeds for the dragonrider, expanding dragon steed options to include all the imperial, outer, and primal dragons! Posted on September 3, 2014, in Uncategorized. Bookmark the permalink. Leave a comment.